Photographer John Francis McCarthy has filled the gallery with an exquisite exhibit of photographs he has taken in the Finger Lakes Region. The show caught the attention of Rebecca Rafferty in her Art Review for City Newspaper, November 10th issue. Click Here for a link to the article that you can read online. Rafferty noted that "My immediate associations with McCarthy's work dart between what we mean by 'paradise' and the word's associations with (relatively) untouched land, the use of these spaces, and the history of ownership of place. Even proud city dwellers like myself relocate their serenity when immersed in the calming beauty of wide-open nature. Everyone needs this separate peace, and everyone should be able to reach it, but not everyone has that luxury." 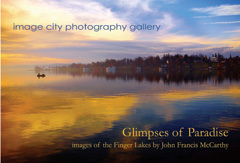 John Francis McCarthy has recently published a book that is available during the show titled The Finger Lakes, Glimpses of Paradise. The book significantly expands the number of images from his Finger Lakes portfolio. Jeff Palm is the featured photographer showing in the East Gallery. Guest Photographers in the show are Thomas Barker, Jim Guistina, Boris Sapozhnikov, Daniel Silver, and Naushad UzZaman. Thomas Barker also has his recently published book, The World is my Oyster, available during the show featuring "a wide variety of recent explorations from the far north of Iceland to the other end of the globe in New Zealand." Award-winning photographs from Camera Rochester competitions are in an exhibition by club members Carl Crumley, Jeno Horvath, David Kotok, Richard Mearns, Peter Nelson, and Lois Trieb. Rounding out the exhibit are Artists-in-Residence Jim Patton and David Perlman and Gallery Partners Daniel P. Crozet, Joel Krenis, Steve Levinson, Gil Maker, Don Menges, Dan Neuberger, Betsy Philips, Gary Thompson, Phyllis Thompson, Sheridan Vincent, and George Wallace. 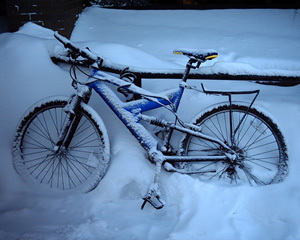 "A photograph I chose Frozen Bike (by Thomas Barker) to comment further on, because not only is the image well seen, captured and presented, but because it has the added intriguing mystery element, that possibly even the photographer does not know the answer to. This is no run-of-the-mill bicycle, exemplified by several features from the frame to the shocks, and supported by the fact that it is very securely attached to the metal stand. Almost certainly, this bicycle is reasonably unique, and the pride and joy of the owner. Due to the large amount of snow in the print, the image is almost monochromatic, the only color relief being the distinctive hue of the frame, and the yellow highlight on the seat, that tends to continually draw our attention. There is an overall somber feeling present as we look pensively at this solitary bicycle, sad not because we cannot see it in its fully glory, free of winter's impassioned hold, but wistful because there is a feeling of abandonment." 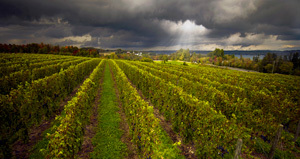 Peter's next choice was Anyela's Vineyard by John Francis McCarthy "Like many of John's exquisite images, this one truly captures the essence, feeling and majesty of the Finger Lakes. This impressive and artistic print, strikingly expresses the passage of time across the land with serene eloquence. One can listen and hear the unspoken saga of the vineyard, we can listen and tell the story. This is a subject for contemplation and inspiration, a time of awakening and renewal. Here, our eyes can roam and ramble through stately avenues of grapevines, catching every ray of sunlight, which enchantingly charts and paints these tailored structures against the impressive expanse of hillside. You can feel the absolute vitality of these vines, as they individually undertake their sole mission of producing mature fruit of the highest quality, fruit that they hope will eventually produce wine of a superior vintage." Peter chose a second of John Francis McCarthy's photographs. "One of my favorite Taoist statements is, 'The bells and stones have voices but, unless they are struck, they will not sound.' 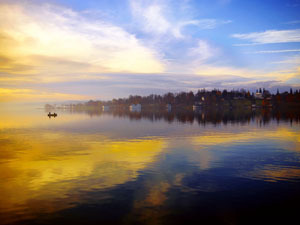 John Francis McCarthy has certainly struck in showing us his deep love for the Finger Lakes with his sublime images, which imbue an exalted inspiration, and a restorative feeling that the area is closer to paradise, and the end result is pure music. Certainly he carries with him a sense of wonder that permeates throughout his prints, illustrative of a quotation from Henry Ward Beecher, namely, 'Every artist dips his brush in his own soul, and paints his own nature into his pictures.' In Morning Colors, there is a sense of overwhelming calm, as we experience a serene, eloquent vista, where beauty is not static, but contingent upon each individual's unique preferences, feelings and circumstances. From the quietness and magical atmosphere, the viewer's emotions appeal to, and captivate the subconscious, resulting in the misty morning light, and the sumptuous colors bursting forth to dance together, and where the reflections seem to float in an infinite space." 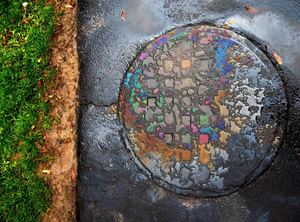 Peter's next choice was Pollution Pallette by Boris Sapozhnikov, "Boris's imposing pictures of a sewer cover are imaginatively seen and creatively captured, wonderfully illustrating how even a seemingly mundane object can be the star subject in an impressive photographic print. For the viewer, it is further evidence that we should forget the name of what we are looking at, relax our conditioning and beliefs, and eliminate the cognitive need to categorize or label. Using our imagination, viewing art can set off a chain of inspiration. As Jeff Berner so expressively states, 'Looking is a gift, but seeing is power.' Seeing in the finest and deepest sense, means fully using your senses, intellect and emotions, and encountering your subject matter with your whole being. In the original print, we are aware of what looks like oily deposits on a metallic surface, which when mixed with possibly water, results in droplets that have been transformed in spectacular fashion, to give both orderly and variable surface patterns, which have a spectacular range of hue and saturation." Peter's also chose Misty Sunset over Icebergs by Daniel Silver. "Instead of commenting on just one of Daniel's fine images, I decided to briefly discuss a few of them in order to promote the fact that this young photographer has a considerable amount of photographic and artistic talent, as impressively displayed in his panel of prints. To mention just a few images that really inspired me, one's eye would immediately go to the print of the rainbow, powerfully and gracefully arced over the Icelandic Church complex, superbly seen and captured. 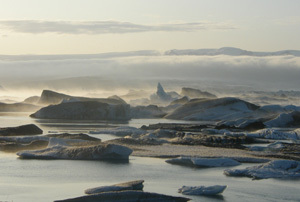 The arctic icebergs (shown at left) were equally creatively captured under a misty sunset, which in the larger print take on the suggestive appearance of basking whales coming ashore. Equally compelling are the prints where imaginative composition and subject positioning, truly enhances the images. This is dramatically seen in the view of the pyramids, which is visually enhanced by the foreground positioning of the two camels, and by the photograph of the Great Blue Heron, artfully posed in the extreme left hand side of a large blue negative space of sky, which by the way subtly contains an image of the moon". 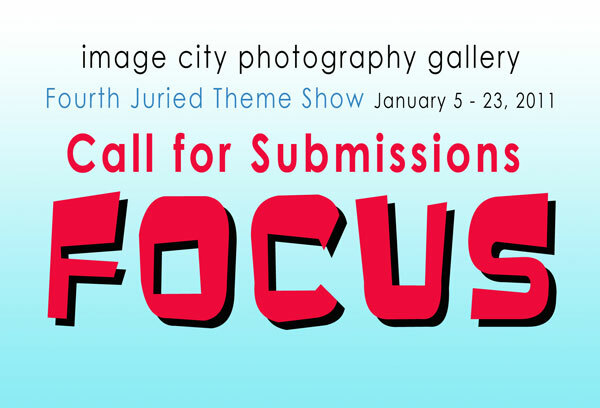 Each month, we have had a good turnout for Image City Critiques, a free program we offer at the Gallery to provide participants an opportunity to review their photographs and participate in a friendly, constructive, and positive critique. The sessions are held on the first Wednesday of the month and the next is Wednesday, December 1st from 7:00-9:00 pm. Join us and please bring 2 or 3 jpg images that are at most 1MB in size and at most 1500 pixels on the longest side. You may also bring prints, or images on a CD or on a thumb drive. If you have any questions please contact Don Menges (dmenges@rochester.rr.com) or Gil Maker (gmaker@mac.com). We look forward to meeting with you on Wednesday, December 1 at 7pm. We look forward to receiving your submission postmarked by or delivered to the gallery by November 14, 2010 at the latest. On the last day of a Winter trip to Yosemite National Park I was totally engrossed in photographing delicate snow patterns on trees in a shaded area of Yosemite Valley. For some reason I turned around and was stunned by the beauty of light striking the cliffs of El Capitan and its nearby trees approximately 180 degrees from where I was shooting. I quickly packed up my equipment and, pumped with adrenalin, I jogged across the valley meadow. I set up my tripod about 100 yards from a group of trees in front of El Capitan and began shooting images with my 35 mm camera. As the sun dipped behind me, shadows began to cover the trees and move towards the cliffs. Recognizing that the sunlight was rapidly being replaced by shadows, I switched to my medium format Pentax 67 camera. By then the shadows were moving rapidly up the cliffs of El Capitan. I squeezed in several bracketed images before the cliffs became completely enveloped in shade. I felt very fortunate to have glanced behind me earlier to see what was happening on the northeast cliffs of the valley. I was equally fortunate for having moved quickly across the valley to capture images of El Capitan and then making the adjustment to medium format in time to capture the scene with great light. I have often become so involved in shooting 35 mm that I don't think to start photographing with my medium format camera until the quality of light has diminished. Being ready, moving quickly and making a last minute adjustment allowed me to capture my favorite image of a week long trip. 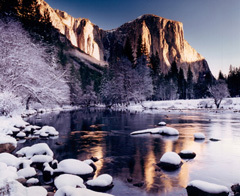 My example image is titled Winter Sunset on El Capitan. It was very interesting for me to experience the phenomena of a sunset where the light seemed to move upward instead of having a sun sink lower in the sky until it drops below the horizon.